Hatters boss Nathan Jones is fully aware just what a tough test promotion-chasing Oxford United will be to his side this afternoon. The U’s are second in the League Two table and did look firm favourites to go up in recent weeks, although have been hauled back by Accrington and Bristol Rovers. United’s home form hasn’t the best either, with eight wins in front of their own fans this term, compared to 13 on their travels as Jones said: “They’re a good side, they’re not second in the league for anything, they play with a high tempo, they’ve got good quality players and they’re a very very dangerous side. “I think the manager (Michael Appleton) has been there, this is his third season now. He came late one season, had a full season last year, another full season, so he’s been able to put a stamp on things. Luton themselves are only harbouring the slimmest of play-off hopes now as they lost three in a row until beating Dagenham & Redbridge on Tuesday night. Trailing seventh by six points was a frustration to Jones, who continued: “I think generally we’ve been in good form, it’s just a shame we didn’t pick up maybe three more points in that home spell that we had because if we had it could have been an interesting scenario. “But we’ll be ready and we’re right at it, and are looking forward to the game. 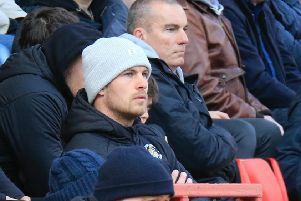 U’s boss Michael Appleton had been at Kenilworth Road on TUesday night to see Luton defeat the basement side as on what he thought about Town, he said: “They are a decent side. I think if you allow them to play they will do and they will certainly try and work the ball into the wide areas, where they have a lot of quality players who have played at a high level. “They still have an opportunity to get into the play-offs with five games to go, so we are mindful of that. But we are mindful it’s a game we want to win – and need to win. We will be doing everything we can to make sure we do that. “Having been at the game (on Tuesday), there was no doubt they were going to win. If I’m being honest it was a stroll for them. Since taking over, Jones has picked up 26 points from his 16 games, a tally he feels could and should be even better too, adding: “I think we’ve really impacted in the 16 games since we’ve been here, picked up a good haul of points. “It would be slightly better as in the last five games we’ve picked up six points, if we’d picked up slightly more than that they we have really had a good haul.